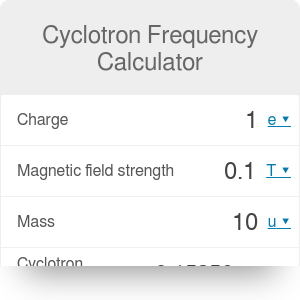 Cyclotron Frequency Calculator helps you calculate the frequency of circular motion of a charged particle in a magnetic field. Reading the text below you will learn what a cyclotron is, how to compute cyclotron frequency and what is cyclotron velocity. Cyclotrons were one of the first particle's accelerators. The particles in cyclotron are moving in semicircular paths. Every time they pass a particular region, an electric field is switched on to accelerate them. To successfully accelerate the particles we need to know the rate at which the particles go around so that we switch on the electric field exactly when the particle passes through this region. This rate is the cyclotron frequency. So how to compute cyclotron frequency? This equation does not take into account the relativistic effects and breaks down if the magnetic field is too strong or the particle mass is too small. In the advanced mode, you can compute the cyclotron velocity. It is a velocity of a particle moving in a circle with cyclotron frequency. To do this, you need to specify the radius of the circular motion. Beware that if you choose the radius too large, you can easily exceed the speed of light! This is not a sign of a breakdown of special relativity; instead, it signals the need to include the relativistic effects. It turns out that the closer the particle's velocity to the speed of light the more energy it takes it to accelerate it further. The equation for the cyclotron frequency does not take this effect into account, and that's why it might sometimes give wrong answers. Cyclotron Frequency Calculator can be embedded on your website to enrich the content you wrote and make it easier for your visitors to understand your message.